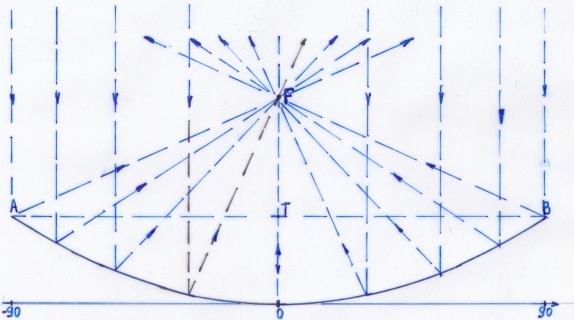 The reflector of a solar parabolic cooker (SPC) is axially symmetrical and shaped so its cross-section is a parabola; for that reason it has the property of bringing parallel rays of sunlight to a focus. What we have in parabolics is actually a focus spot with small but finite dimensions rather than an infinitly small focus point. If the axis of symmetry is aimed at the sun, a metal object that is located at the focus spot receives highly concentrated sunlight, absorbs it and therefore becomes very hot. This is the basis for the use of this kind of reflector for solar cooking. Relevant to the functioning of SPC is only direct solar radiation(DSR), being measured in W/m2. That's radiation reaching SPC as a beam of parallel rays directly from the sun. Basic SPC parameters illustrated by the cookers of HoSa Solar Ltd.